Today Apple released the long awaited OS X 10.9.3 update. The update comes after nine weeks of beta testing, each week with a new release. One of the most interesting things about the update is not in its content but in how Apple opened up their beta seed program to all users when it was traditionally reserved for those who are part of Apple’s developer program. 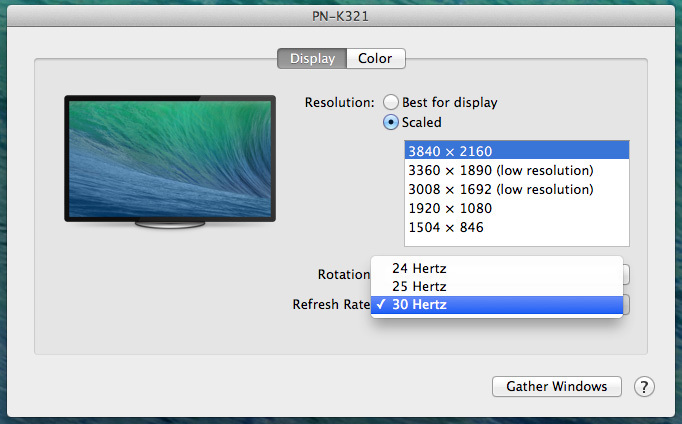 The most major improvement of the update is the improved 4K (3840x2160) display support on OS X. 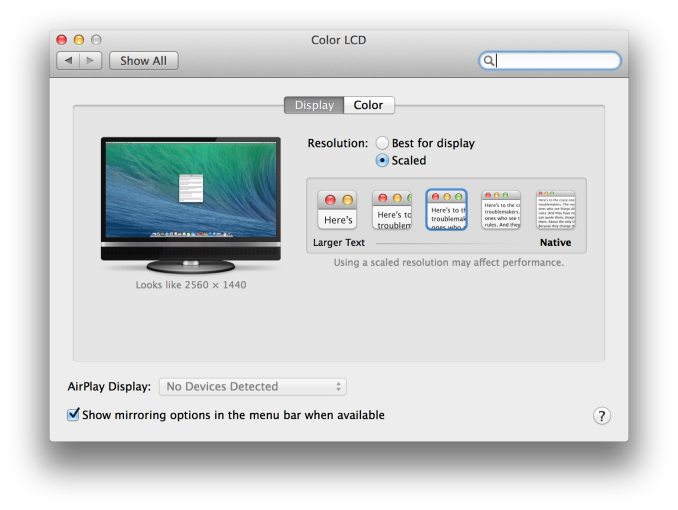 Prior to 10.9.3 the support for 4K displays on OS X was lacking. Only a small group of monitors from ASUS and Sharp were supported for running at 3840x2160 with a 60Hz refresh rate, and the scaled display options that Apple introduced with the original Macbook Pro with Retina Display were unavailable. This made for poor usability on monitors like the Dell UP2414Q which is only 24” and has extremely small UI elements when running unscaled at its native resolution. In 10.9.3 Apple has greatly expanded the list of compatible 4K displays and has introduced scaling modes for those who prefer sharper UI elements over display real estate. Anand took a look at the changes to 4K support in the first beta of 10.9.3. Apple now gives the user options for display scaling which includes settings for a workspace that looks like 3200x1800, 2560x1440, 1920x1080, or 1280x720. All of these are handled the same way as on the Macbook Pro with Retina Display where the display is rendered offscreen at twice the selected vertical and horizontal resolution and then scaled down to the panel. In the case of the 3200x1800 setting this means that the display is rendered offscreen at 6400x3600 which may cause performance issues when being driven with the Intel Iris graphics of a Macbook Pro with Retina Display or the entry level 21.5” iMac. With 10.9.3 Apple has not only broadly increased support for 4K displays, but also enabled 60Hz output to 4K displays on more systems. The Dell UP2414Q, a 24" 3840 x 2160 display, is now properly supported by OS X and Macs that can drive it at its native resolution. Apple appears to have manually added a profile for the UP2414Q as its scaled resolutions are somewhat different from the 30" Sharp/ASUS 4K panels. There is no native 3840 x 2160 resolution exposed on the UP2414Q and by default OS X appears to want to run the panel in a 1080p Hi-DPI mode. This is similar to what happens on the rMBPs where text/UI elements appear as they would on a 1080p display, while images, videos and other similar objects appear as they would on a 3840 x 2160 display. The 24" 4K panel gains a new intermediate scaled mode of 2304 x 1296. The table above shows the frame buffer resolution in paratheses. For example, the screenshot below was taken with the UP2414Q set to its highest scaled resolution (3008 x 1692). The full untouched PNG weighs in at 19.8MB from OS X and is a 6016 x 3384 image. At the highest scaled resolution setting the frame buffer is now over 20 megapixels (excluding the 5MP primary Retina Display), which is just insane. The screenshot open in Preview (screenshot within the screenshot) is a 2880 x 1800 screenshot, open at full size. Note how little space the screenshot occupies. Apple's Hi-DPI scaling and seamless integration across the ecosystem continues to be awesome. Along with expanded display support, some new Macs also get the ability to drive 4K panels at 60Hz. By some I mean one: the 15-inch MacBook Pro with Retina Display from late 2013. This is the Haswell refresh of the rMBP15, and it remains the only portable Mac capable of driving a 4K panel at 60Hz over either of its two miniDP ports (HDMI is limited to 30Hz). The 13-inch Haswell rMBP unfortunately doesn't support 4K60, although you can use its HDMI port to drive a 4K panel at 30Hz (I noted MST compatibility issues when trying to use the 2013 rMBP13's miniDP out). I suspect this has more to do with performance than a physical hardware limitation, as even running the 13-inch rMBP's primary display at a high frame rate can be a chore with a lot of windows open. The 15-inch 2013 rMBP forces the use of its GeForce GT 750M whenever you connect an external display, which helps ensure a better experience when driving a couple of high res displays. 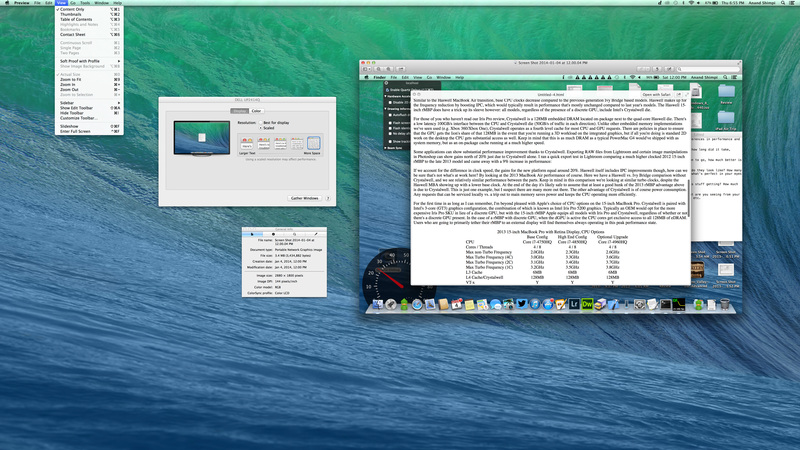 Obviously the new Mac Pro works just fine with these displays as well. Update: As many of you have pointed out, the base 15-inch 2013 rMBP also lacks a discrete GPU. Apple doesn't specifically exclude the entry level 15-inch rMBP in its release notes. Driving ultra high resolutions (up to nearly 26MP across two displays) is mostly an exercise in memory bandwidth and ROP performance. The 15-inch rMBP benefits from having Intel's Crystalwell eDRAM on-package, which should help tremendously in the memory bandwidth department at least. If anything, the lack of Crystalwell is probably what keeps the 13-inch rMBP from getting access to the higher scaled resolution modes at least. OS X 10.9.3 is available now to all Mac users with a computer that supports OS X Mavericks. The changelog for the update is available in the source below and Apple will put up a page detailing the security content of the update on their security page shortly. I'm sorry if I've overlooked this, but is there any resolution to your problem yet? To get the HDMI to drive correctly I needed to use SwitchResX - the native display option only offered 1080p as the highest resolution. This configuration also works well in clamshell mode, with just the 2 external displays connected. "Only a small group of monitors from ASUS and Sharp were supported for running at 3840x2160 with a 60Hz refresh rate..."